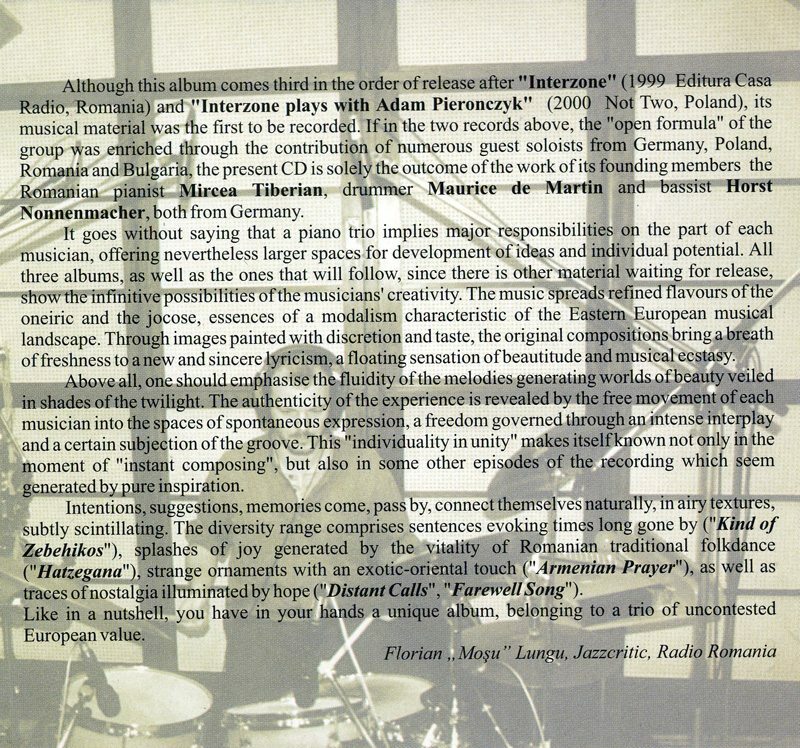 in the order of release after “Interzone” Radio, Romania) and “Interzone plays with Adam Pieronczyk” (2000 Not Two, Poland), its musical material was the first to be recorded. 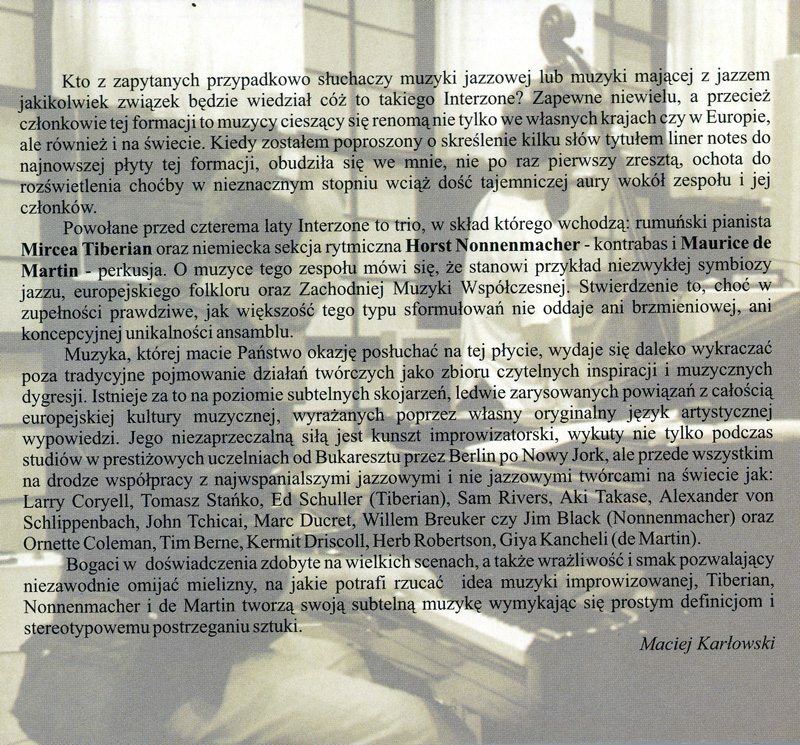 If in the two records above, the “open formula” of the group was enriched through the contribution of numerous guest soloists from Germany, Poland, Romania and Bulgaria, the present CD is solely the outcome of the work of its founding members the Romanian pianist Mircea Tiberian, drummer Maurice de Martin and bassist Horst Nonnenmacher, both from Germany. It goes without saying that a piano trio implies major responsibilities on the part of each musician, offering nevertheless larger spaces for development of ideas and individual potential. All three albums, as well as the ones that will follow, since there is other material waiting for release, show the infinitive possibilities of the musicians’ creativity. 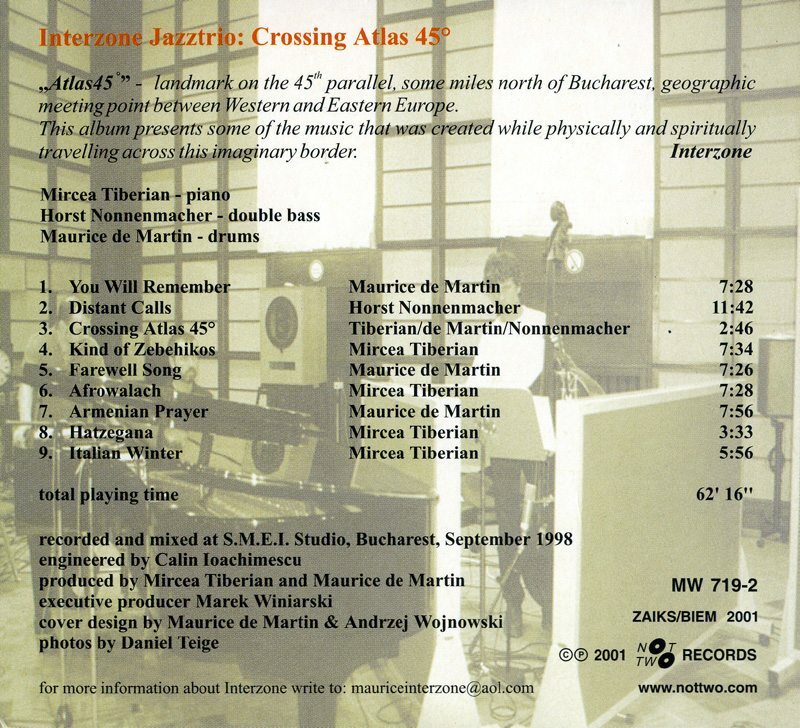 The music spreads refined flavours of the oneiric and the jocose, essences of a modalism characteristic of the Eastern European musical landscape. Through images painted with discretion and taste, the original compositions bring a breath of freshness to a new and sincere lyricism, a floating sensation of beautitude and musical ecstasy. Above all, one should emphasise the fluidity of the melodies generating worlds of beauty veiled in shades of the twilight. The authenticity of the experience is revealed by the free movement of each musician into the spaces of spontaneous expression, a freedom governed through an intense interplay and a certain subjection of the groove. This “individuality in unity” makes itself known not only in the moment of “instant composing”, but also in some other episodes of the recording which seem generated by pure inspiration.